Perhaps the most influential image of the Southwest in recent years was created by popular culture in Breaking Bad, the immensely popular AMC series that ran from 2008 to 2013, and its current spin-off, Better Call Saul. Both shows portray an Albuquerque of dusty deserts and barren asphalt, filled with grifters, addicts, drug pushers, deadbeat dads, desperate losers and kingpins, who exist alongside mostly decent and yet corruptible citizens. These shows evoke a measure of sympathy for the rule-breakers they portray. Don Waters sets his fine recent story collection, The Saints of Rattlesnake Mountain, in a Southwest somewhere in the neighborhood of Breaking Bad’s Albuquerque. Waters’ territory features less violence and more spiritual reflection, but its contours are familiar. Waters, the author of two previous books, grew up in Reno, Nevada, and lives in Portland, Oregon. His characters, like those in Breaking Bad, have never met a bad idea they didn’t love. In the title story, a convict is transferred to a prison ranch amid sagebrush-choked and arroyo-furrowed country in Nevada, where his work with mustangs is intended to rehabilitate him. Instead, it spurs him to realize how unprepared he is for life outside of prison. In other stories, Waters’ characters stay on the right side of the law, just barely. In “Española,” Waters follows Lucero, a conflicted veteran with the self-discipline of an ascetic who returns home to Española, New Mexico, after serving in Iraq. He discovers a town beset by addiction, where his junkie father has sold his sister to pay off a drug debt, prompting Lucero to engage in a combat-style mission in his own hometown. In a story with an utterly different protagonist, “La Luz de Jesús,” James, a ridiculous low-level actor and wannabe screenwriter from Los Angeles, shows up to New Mexico in costume, wearing illegal cowboy boots “made from sealskin and purchased from a Russian in La Brea with an orange rub-on tan.” He’s hoping the setting will inspire him to finally finish a screenplay, but instead he’s unexpectedly enthralled by a group of local penitentes, who meet for religious rites including self-flagellation. Against all odds, the frivolous James, a lapsed Catholic, ends up re-enacting Jesus’ long walk to Calvary, dragging a heavy cross down a dirt lane. 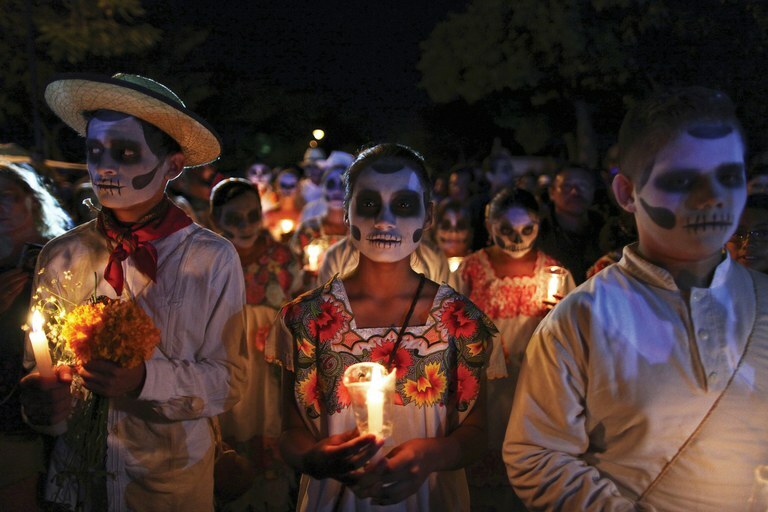 A Parade of Souls is part of Day of the Dead celebrations in Merida, Mexico. “Todos Santos” features another character so enraptured by nature that he becomes unmoored from his obligations to other people. In this case, the protagonist is a middle-aged surf bum named Tom who runs a surfing lesson operation in Baja. Tom cares about nothing except surfing. “He fell in love with a thing, he followed the thing, and before long the thing had its hooks in him and it was the only thing he knew.” He neglects to tell his girlfriend that he has a teenage son he abandoned before birth. When the son and his stepdad visit Tom’s town, forcing him to reckon with his mistakes and choices, Waters makes clear the deep and lasting scars this kind of person can leave in the lives of others. One of the strongest stories in the book is “Day of the Dead,” about a young man dying of cancer, who decides to kill himself before the disease ravages him. But he doesn’t want to do it alone, so he finds a group of other sufferers online who plan to cross the border into Juarez, a violent city that few tourists without a death wish venture to. They plan to commit suicide on El Día de Los Muertos. The subject may sound macabre, but Waters’ take on it is darkly comic, lovely and moving. Note: A previous version of this article stated Breaking Bad ran on HBO, not AMC.